The world of rock and metal is no stranger to products such as coffee, beer and whisky being associated with bands. 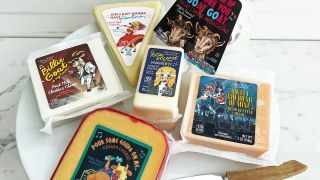 There are dozens of officially licensed products on the market – but discount supermarket chain Aldi might just have taken the prize for the most ingenious band-related products yet… thanks to their new range of cheese. Delish report that, ahead of the annual Grammy Awards, Aldi's Happy Farms brand will launch six products named after some rock and pop classics. From February 6, stores in the US – there’s no word yet if these will be in European locations – music fans will be able to get their hands on Sweet Cheddar Of Mine, Pour Some Gouda On Me, Wake Me Up Before You Goat Goat, Girls Just Wanna Have Fontina and Total Eclipse Of The Havarti. All six are limited edition, so be quick. What’s next? I Stilton Haven’t Found What I’m Looking For? Jumpin’ Monterey Jack Flash? Roquefort Of Ages? I Love Roquefort 'N' Roll? Gypsies, Tramps and Cheese? Lady In Red Leicester? Etc.